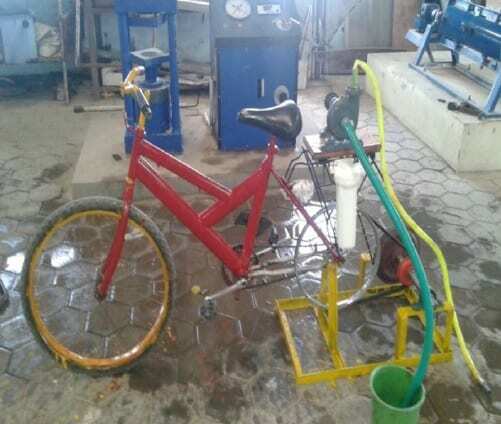 This paper presents fabrication and experimentally investigate the working of Pedal Powered Water Pump (PPWP) along with its purification which had used for pure drinking water supply and garden irrigation. PPWP will consist of a centrifugal pump operated by pedal power. The centrifugal pump is positioned on its stand in such a way that driven shaft of the centrifugal pump was butted to the bicycle wheel. By pedaling the bicycle, the bicycle wheel rotates, thereby rotating the centrifugal pump which in turns discharges water from the sump. PPWP provides drinking water and irrigation in remote areas where electricity is not available. PPWP is not only free from pollution but also provide healthy exercise. PPWP reduces the rising energy costs. PPWP will design as a portable one which can be use for irrigation in various places. The experimental investigation was execute and performance of the PPWP had carried out at different rpm. The results indicate that the PPWP will give a considerable amount of discharge and head. The PPWP requires only manual power thereby reducing the utility bill considerably. Experimental result shows that discharge of about 0.0025m can be obtained for around 140 rpm. Pedal Powered Water Pump along with water purification(PPWPWP) is an eco friendly system. The PPWPWP works only on mechanical energy without electricity. PPWPWP provides drinking water and irrigation in remote areas where electricity is still a major problem .along with providing eco friendly environment it also helps to regulate a good health while pedaling PPWP is not only free from pollution but also provide healthy exercise. PPWPW Produces the rising energy costs. PPWPWP was designed as a portable one which can be used for irrigation in various places. the bicycle wheel. By pedaling the bicycle, the bicycle wheel rotates, thereby rotating the centrifugal pump which in turns discharges water from the sump and transmitted to pre filter which purify the water simultaneously. 1. Power transmission through chain drive mechanism. Power Transmission through Chain Drive: Chain drive is a way of transmitting mechanical power from one place to another. It is often used to convey power to the wheels of a vehicle, particularly bicycles and motorcycles. It is also used in a wide variety of machines besides vehicles. Most often, the power is conveyed by a roller chain, known as the drive chain or transmission chain, passing over a sprocket gear, with the teeth of the gear meshing with the holes in the links of the chain. The gear is turned, and this pulls the chain putting mechanical force into the system. Bernoulli’s principle: In fluid dynamics, Bernoulli’s principle states that an increase in the speed of a fluid occurs simultaneously with a decrease in pressure or a decrease in the fluid’s potential energy. The principle is named after Daniel Bernoulli who published it in his book Hydrodynamica in 1738. Bernoulli’s principle can be applied to various types of fluid flow, resulting in various forms of Bernoulli’s equation; there are different forms of Bernoulli’s equation for different types of flow. The simple form of Bernoulli’s equation is valid for incompressible flows (e.g. most liquid flows and gases moving at low Mach number). More advanced forms may be applied to compressible flows at higher Mach numbers (see the derivations of the Bernoulli equation). can u explain how silly is this idea. this project for diploma holders, mini project , low cost. this is not for guys like you who has Einstein level brains. This is a very nice project. I am working on something related to this. kindly provide me your email ID so I can further discuss about it.